Most people know someone who has been arrested for driving while intoxicated, DWI in New York. Some may even have personal experience with the crime. Even though these arrests happen quite frequently, some individuals may not realize the impact that this crime will have on their lives. In New York, the penalties for DWI continue to increase. The state reviews the penalties each year, and frequently, enacts new legislation that enhances these punishments substantially. Motorists may not be aware of exactly what can happen if they are convicted of a DWI. If a motorist is stopped by police and has a blood-alcohol content of 0.08 percent or higher, or is under the influence of drugs, it is possible that he or she could be facing DWI charges. Police will ask the motorist to submit to a chemical or blood test to determine the motorist’s level of impairment, and if this test is refused, it will result in the immediate suspension of driving privileges for possibly one year due to the state’s implied consent laws. Motorists face fines ranging from $500 to $1000, as well as up to one year in jail for a first offense. They must also pay fines associated with the court case. First-time offenders will also be required to install an ignition interlock device for at least six months after conviction. These devices will not allow operation of a motor vehicle if alcohol is detected on a driver’s breath. The motorists must pay for the installation and monthly monitoring costs associated with the device. If the individual is convicted of later DWI offenses, the amount of time with the interlock device will increase. In addition to the criminal penalties, motorists will also face the administrative suspension of their drivers’ licenses. These suspensions will last at least six months. Offenders may try to obtain a conditional license as long as they complete the state’s Drinking Driver Program. Motorists will also be required to pay all costs associated with the program. If you have been arrested for driving while intoxicated, do not panic. Remain calm, and do not discuss your case with law enforcement officers. 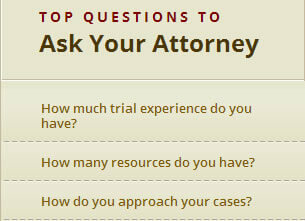 Contact an attorney experienced at handling DWI cases to learn more about your specific options. An attorney can help you protect your rights and driving privileges. Once you understand the seriousness of the charges you are facing, you will be able to ask questions about your next steps. It is important that you are aware of the impact that additional offenses can have, as subsequent convictions could result in the permanent loss of your license.